Mental health issues are more common than you think. In the United States, approximately 18 percent of adults experience a mental illness during a year. And just over four percent of adults have experienced a serious mental illness that has inhibited their ability to participate in daily activities. For those who deal with these conditions, it can often seem isolating. This isolation only increases with the spread of misconceptions about mental illness, labeling those who suffer as crazy or simply unrelatable. This loneliness has been mitigated by the rise of digital communication platforms, which have connected others in many places around the world. Twitter, which has become one of these mediums, is a network that efficiently connects those who suffer from mental illness and addiction through the use of specific hashtags and even dedicated accounts that consistently offer advice and information to their followers. When a user searches a topic or a hashtag, they can be linked to a conversation with others who suffer the same difficulties and find a community that doesn’t seem to exist in the real community around them. To fully understand not only the depth of this conversation but the people who are partaking in it, we took a closer look at mental health tweets over a year and the statistics and origins of these tweets and communities. Read on to see which states are originating the most tweets on mental health, which mental health terms are being used most, and how people feel about mental health conversations on Twitter. The cloud above shows the hashtags created to bring users and communities together. They represent the often uncomfortable part of talking about the unglamorous struggle with mental health. Hashtags such as #ChangingMinds and #TimetoTalk were aimed at youths and were created by nonprofits that often sought celebrities to help spread their message. One powerful message under the #TimetoTalk hashtag was written by Robin Williams’s daughter, Zelda Williams. Since her father’s untimely death in 2014, she has openly spoken about his struggle with depression, actively encouraging others to engage in honest discussions about mental health. 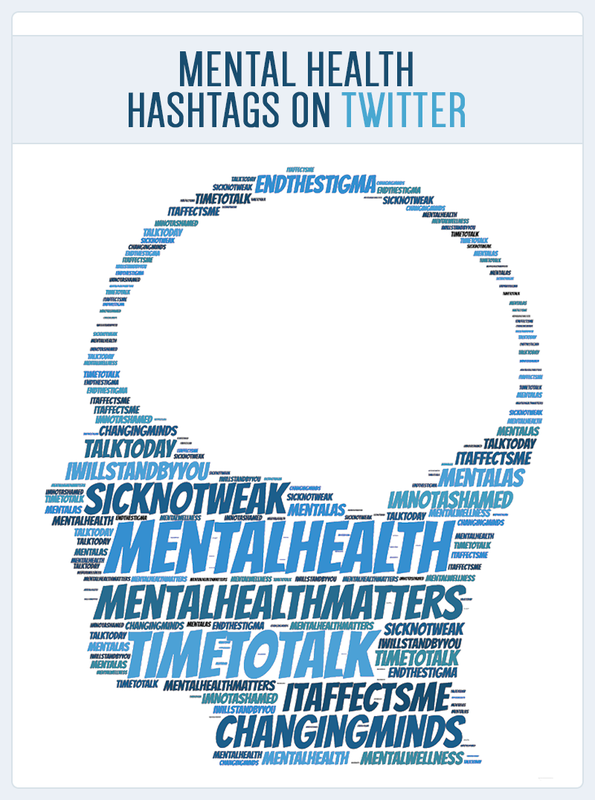 While #MentalHealth was the most used tag, other hashtags such as #EndTheStigma and #MentalHealthMatters showed strong results as conversation starters among friends and communities. In 2015, a UCLA photo series originated the United States campaign “#EndTheStigma.” This created a community of Twitter users who were talking about their mental health in frank and open ways. Many took this as an opportunity to speak out about the problems they were facing. They also used it as a resource for finding communities and ways to get help. If you or someone you know is seeking help outside of social networks and communities, PsychGuides.com has resources. You can call to speak with a trained professional and find the support you or a loved one may need. The interactive map above allows you to explore some of the tweets we looked at. By clicking on a map point you can see the tweet that originated from that location. Explore the map to see what people from around the country were adding to the conversation. Twitter has been used to create outreach opportunities for those seeking help, providing information with hashtags that link to awareness and fundraising campaigns. For example, #MentalHealthMatters was used in 2014 by the United Nations Economic and Social Affairs Department for National Youth Day. The hashtag’s goal was to increase the conversation by instigating a social media trend that took away the stigma that may be associated with suffering from a mental illness. The hashtag ultimately brought users to the UN page where it asked for video, art, and writing submissions that could help make the conversation more accessible. 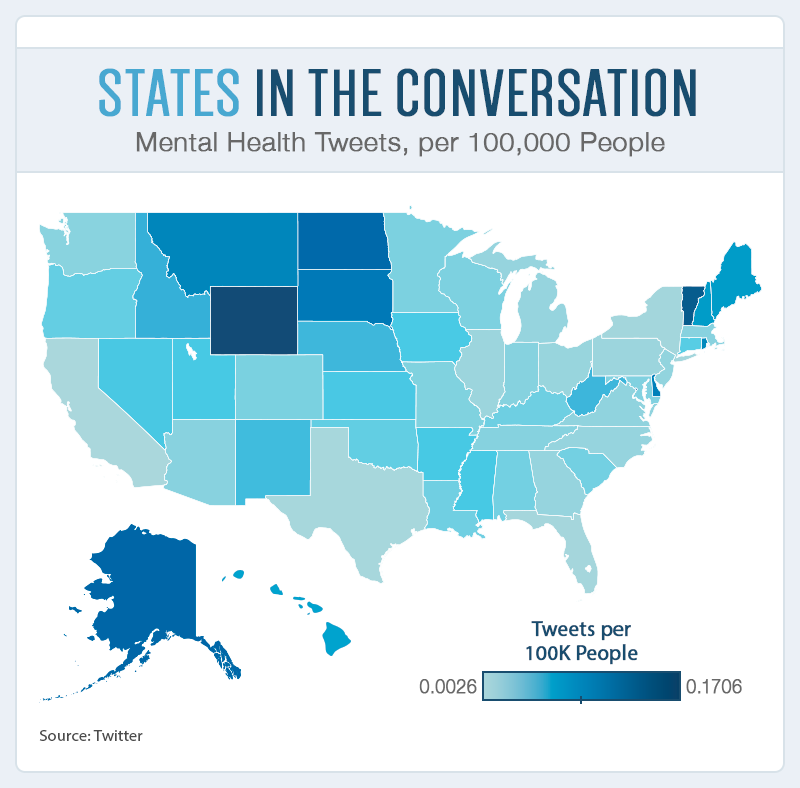 When looking at all of the mental health related tweets we collected, which included 12 different hashtags, the state that produced the highest number of tweets on mental health per 100,000 people was Wyoming, closely followed by Vermont and North Dakota. 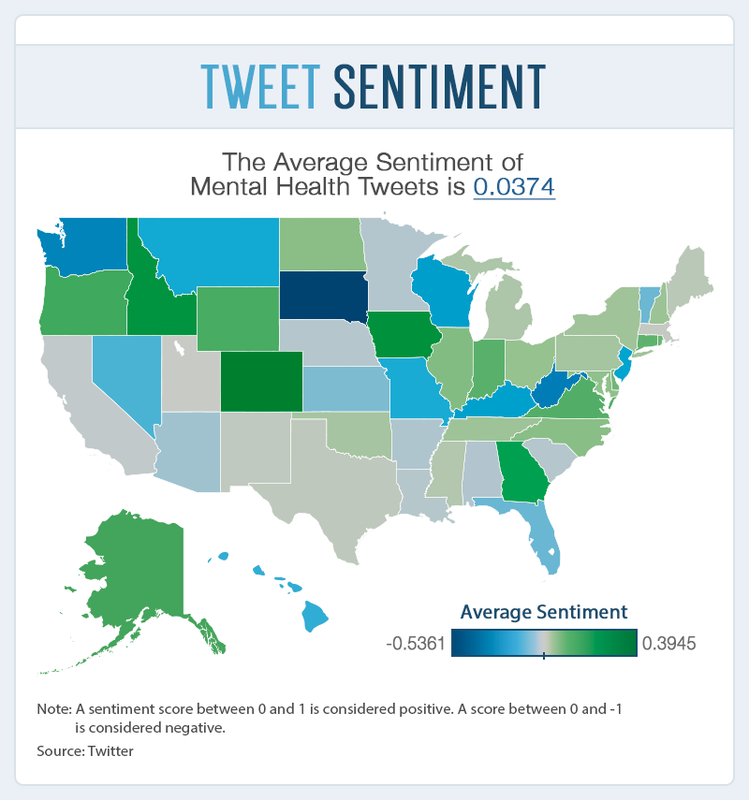 Excluding Vermont, there is a high concentration of mental health tweets coming from the Northwest. On the opposite side of the spectrum, California takes a strong and distinctive lead for the lowest amount of tweets about mental health. There is no denying Twitter’s role in the mental health community. The tweets we looked at had an overall positive sentiment score (per the AlchemyAPI tool), as opposed to those that featured negative-association terms. This trend has been grabbing the attention of governments and the overall health community as people increasingly create communities and campaigns to amplify the conversation. In Colorado, which had the highest average sentiment score, many tweets feature positive words such as “amazing,” “breakthrough,” and “support.” It’s these kinds of tweets that influence the sentiment scores in a positive manner. While some phrases may come up as negative, in the overall context, they may not actually carry a negative message. Words such as “disease” and “crippling” could carry negative connotations when paired with words such as “ugly,” or “disgusting,” , but in the case of mental health tweets, they are sometimes raising awareness of the impact an illness has on people’s lives. The use of Twitter for mental health has helped researchers gain statistics and data about often-mentioned issues and problems that users were facing. In 2014, Johns Hopkins University published its findings on using Twitter metrics to understand the state of mental health among tweeters. This allowed researchers to determine where conditions exist and who they affect. 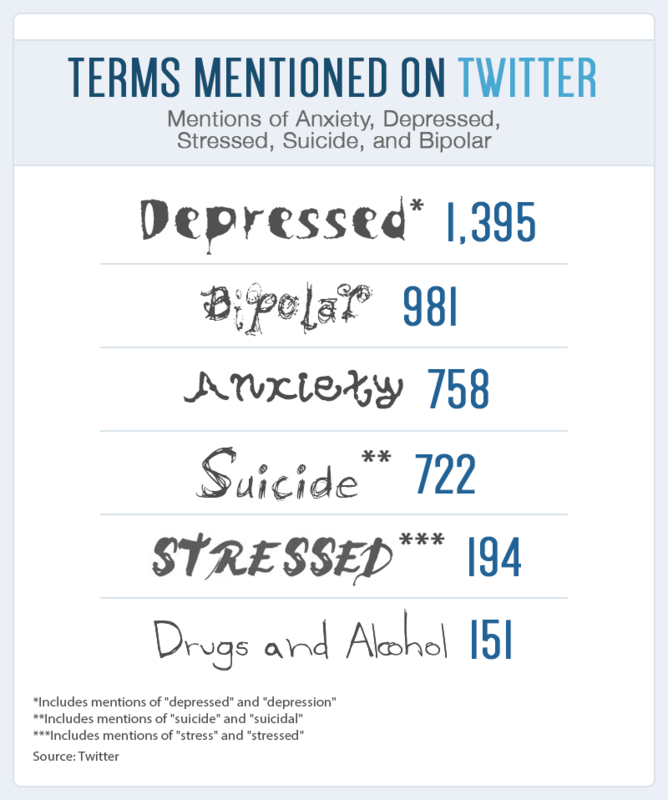 Two of the specific terms that showed up in the study, as well as our analysis, were “depression” and “bipolar disorder.” After the university accumulated the raw data on the usage of these terms on Twitter, it had to go through another process of examining the context in which they were used. 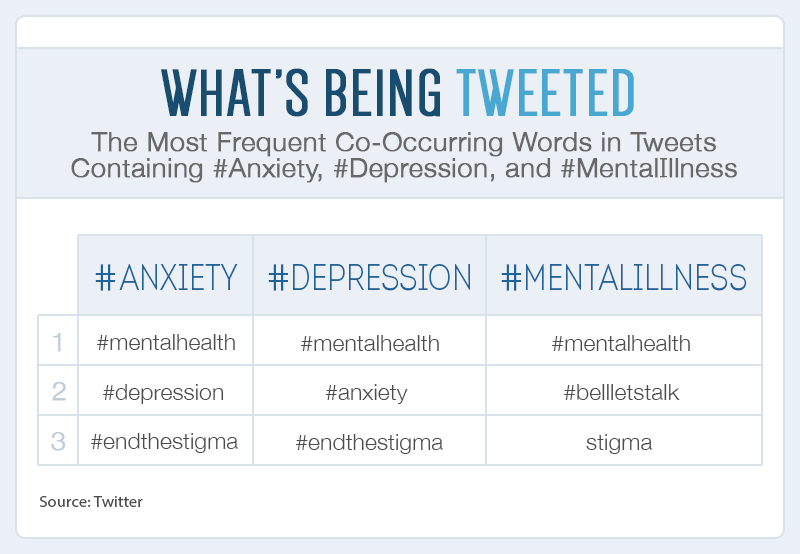 Words that co-occur with specific hashtags reveal other hashtags among the top three spots for the common terms #anxiety, #depression, #mentalillness. This suggests that users are tweeting about multiple causes and tagging more than just one relevant term. Using a data processing tool, we were able to find words that commonly correlate with alcohol, anxiety, drugs, and smoking. We only considered words that had a correlation score of 0.5 or higher and were neither hashtags nor usernames. The correlation score is charted on a scale of 0 to 1 and suggests which words are appearing most frequently. Interestingly, the term alcohol reveals the words “tom” and “vilsack” at high frequencies. This could be linked to Agriculture Secretary Tom Vilsack, who has led efforts to combat drug and alcohol addiction in rural areas of the U.S. over the past year. Even if there is no one in your life who you believe can understand what you are going through, there is a community you can connect with instantly. These data prove that you are not alone. No matter your struggle, there is always someone else out there who is struggling the same as you. If you are one of the many who feel alone while dealing with a mental illness, PhychGuides.com has the resources you need to learn more about your condition and reach out for help. Using Twitter’s API, we scraped for 12 different mental health–related hashtags and collected 18,892 tweets. Using AlchemyAPI’s sentiment analysis tool, we were able to determine how positive or negative people were in their tweets. Note: We loaded the text file and removed all links and punctuation except for @ and # to keep usernames and hashtags intact. From there, the text mining package was used to create a term-document matrix in which each tweet was treated as a document. Using the function “findAssocs,” we were able to locate words linked to each keyword. The assets found on this page are free to reuse and share. When doing so, we ask that you link back to the original page so that readers may see more of the project and methodology.